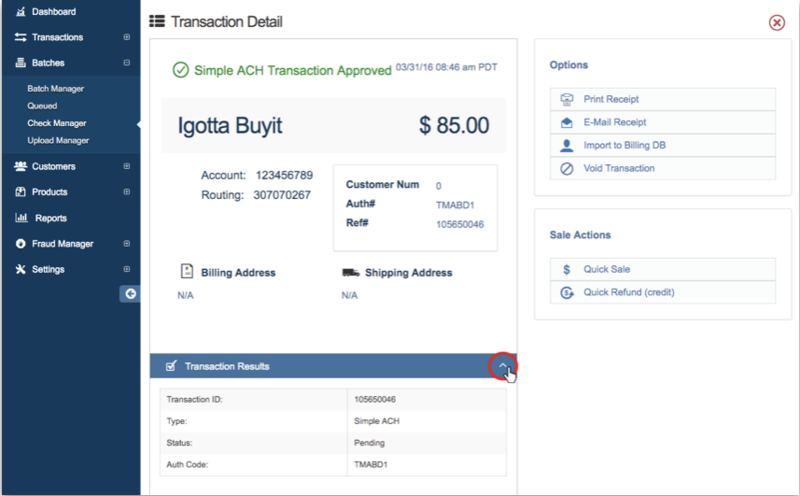 The Check Manager allows you to view and manage Simple ACH transactions. This page shows Simple ACH transactions made from month to month. Unlike the Batch Manager and Queued Transactions, you do not have to close a Simple ACH transaction to process it. Please Note: The Check Manager can only be used if you are enabled to process ACH transactions. If you are not currently enabled to process this type of transaction, please contact your reseller. 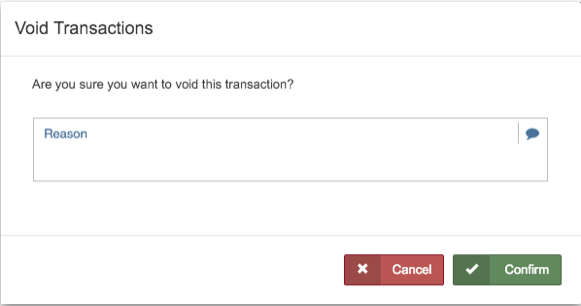 The check manager allows you to perform bulk actions on ACH transactions. Check the boxes for each transaction you would like to perform a bulk action on. Click on the carrot on the upper right to see the available bulk actions. The ACH transactions are shown in a table where you can see each of the transaction’s details, such as the Customer’s name, type of transaction (sale or credit), the customer’s account number, transaction amount, authorization (Auth) code, and transaction’s status. Transactions from 3/01/2016 to 03/31/2016 are shown in the table below. By default, your ACH transactions are arranged by newest to oldest in the table. If desired, you can rearrange this table based on the customer’s name, the type or transaction, the account number, the amount, the authorization code, or the status. For example, to rearrange the table by the amount in ascending order, click on the ‘Amount’ field on the top bar of the table. To add or remove field specific fields, click 'Options' located at the top right hand side of the page then click on ‘Customize Table’ from the drop down menu. The ‘Table Options’ pop up window will appear showing your current fields and available fields. To add more columns into the Check Manager table, drag and drop a field button into the ‘Current Fields’ section. To remove a specific column, click the field button you want to remove and drag it into the ‘Available Fields’ section. Once you have finished adding or removing specific fields, click 'OK'. If you want to reset your table to the default fields, click 'Reset Default' from the same Table Options window. 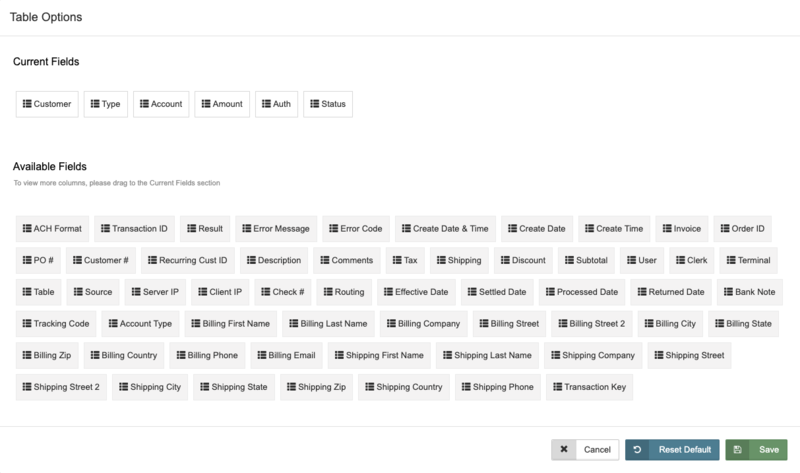 To Export your check transactions data, click 'Options' located at the top right hand side of your page. Select ‘Export’ from the drop down menu. Please Note: The exported file will only contain fields displayed on your Check Manager page. To add more fields, see the Batch Options section of this page. To Print your check transactions data, click 'Options' located at the top right hand side of your page. Select ‘Print’ from the drop down menu. To Email your check transactions data, click 'Options' located at the top right hand side of your page. Select ‘Email’ from the drop down menu. 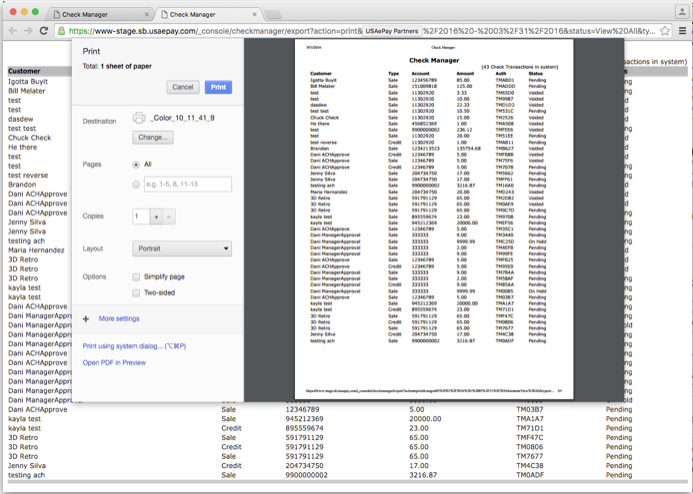 Please Note: The exported, printed, and emailed files will only contain information displayed on the Check Manager page. 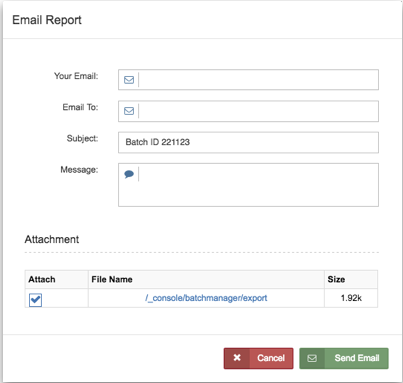 To add more fields into your files, see the Batch Options section of this page. To add transactions from days not shown, use the Search by Date section of this page to expand or shrink the date range. You can search for a transaction by a particular field, by date, by type and by status. You can also use a combination of two or more of these methods to narrow down the transactions in Check Manager. The individual fields you can search by are: the customer’s name, account number, amount, or authorization code. To search for a transaction or group of transaction by field, click on the search icon located at the top right hand side of the Check Manager page and type in the criteria you are looking for. The page will automatically display all the transactions associated with the criteria you entered. Click 'Select Date' on upper right hand side of the Check Manager page. This feature allows you view transactions by ‘Today’, the ‘Last 7 days’, ‘The Previous Month’, ‘Quarter 1’, ‘Quarter 2, ‘Quarter 3’, ‘Quarter 4’, a ‘Specific Date’, or a specific ‘Date Range’. Select the date(s) you wish to view. The page will automatically show transactions for the selected time period. The Check Manager allows you to filter by the following transaction type options: View All, Refund, Sale, or Credit transactions. Click 'Type:View All' on top right hand side of the Check Manager page. Check the box of the type of transactions you wish to view. For example, the image below shows that a merchant has selected ‘Credit’. Once the ‘Credit’ box is selected, the page automatically lists all credit transactions. Submitted - The transaction has been sent to the bank. Please Note: Once the transaction is sent, it can no longer be voided. Timed-Out - No update has been received from the processor in 5 days. Mgr Approval - The transaction has been placed on hold pending for a manager’s approval. Settled - The transaction has been processed and cleared. Voided - The transaction has been voided. Pending - The transaction has not been sent to the bank yet. Click 'Status:View All' on top right hand side of the Check Manager page. Check the box of the type of transaction you want to see. For example, the image below shows that a merchant has selected ‘Voided’. Once the ‘Voided’ box is selected, the page automatically lists all voided transactions. On the Check Manager page, you can view a transaction’s complete details using one of the following methods: by right-clicking on the transaction then selecting ‘Details’ or by clicking on the transaction to be directed to the transaction detail page. Once you click the transaction from the table, you will be taken to its ‘Transaction Detail’ page. See image below. Transaction Results: the transaction key, transaction ID, type of transaction, status, and authorization code. Please Note: The Transaction Results, Transaction Source, and Check Details can be viewed by clicking on the drop down button. You can void a transaction and give the customer a refund from a transaction’s detail page or from right clicking the transaction from the Check Manager page. Click on ‘Void Transaction’. See image below. A pop up window will appear to confirm the void, prompting you to enter a reason for the void. This field is required. Click 'Confirm' once you have entered the reason. On the Check Manager homepage, right click on the transaction you wish to void. The Check Manager allows you to do a Quick Sale transaction through a transaction’s detail page or the Check Manager homepage. A pop up window will appear. 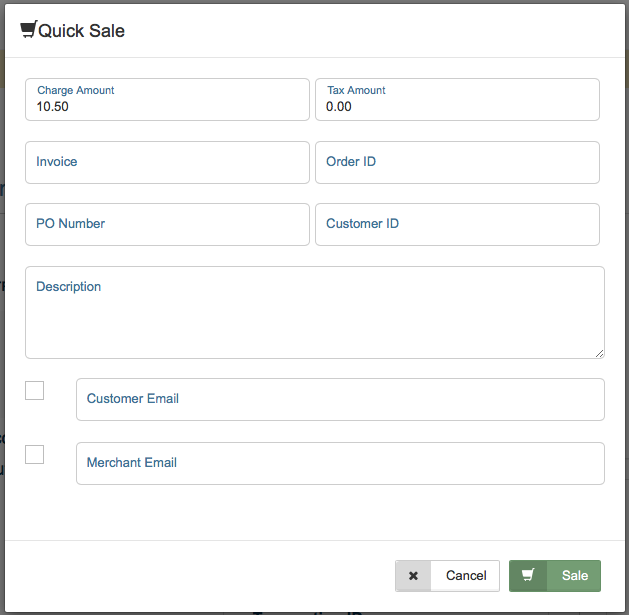 Fill out the desired fields (Amount, Tax, Invoice, Order ID, PO#, Customer ID, or Description) to process the Quick Sale. The ‘Charge Amount’ field is the only required field to process the sale. Once you have entered the necessary information, and if all the information is correct, click 'Sale'. Please Note: The system will use the same information (such as the customer’s account number and routing number) to process the transaction. A confirmation message will appear with one of three responses: ‘Transaction Approved’, ‘Transaction Declined’, or ‘Error’. Right click on the customer you want the transaction to associate with, then click ‘Quick Sale’. 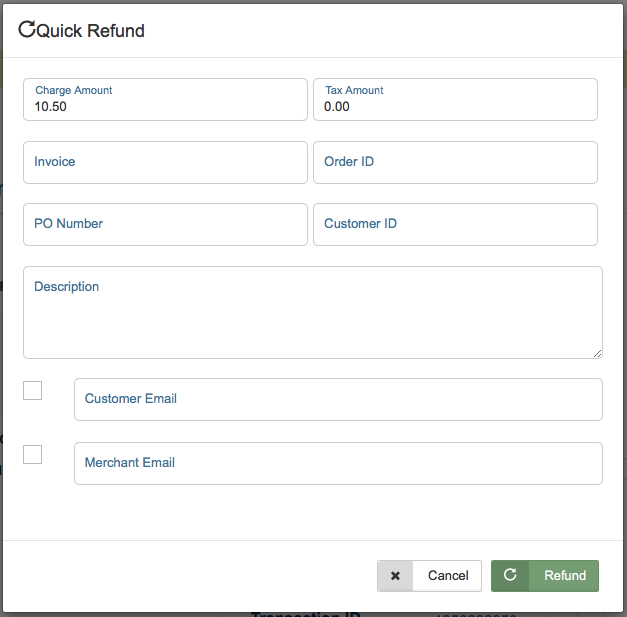 The Check Manager allows you to do a Quick Refund transaction through a transaction’s detail page or the Check Manager homepage. 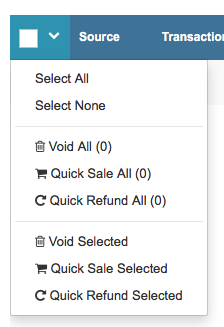 Click on ‘Quick Refund (credit)’ in the ‘Sale Actions’ section. A pop up window will appear. Fill out the refund or credit information fields (Amount, Tax, Invoice, Order ID, PO#, Customer ID, and Description) to process the refund. Once you have entered the necessary information, click 'Refund'. Please Note: The Amount field is the only field required, all the other fields are optional. The system will use the same information (such as the customer’s account number and routing number) to process the transaction. Right click on the transaction you wish to issue a refund to, then click ‘Quick Refund’.